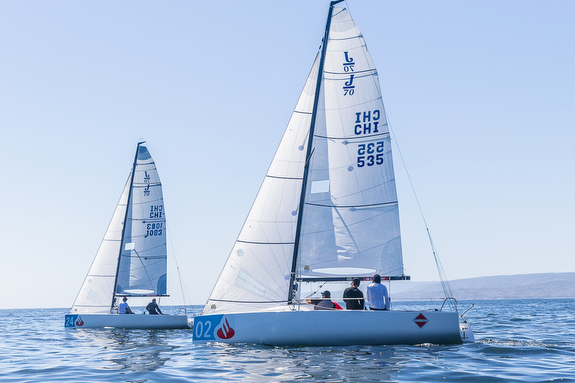 (Algarrobo, Chile)- A highly competitive fleet of nineteen boats eagerly rigged up, tuned their boats to perfection, and headed out across the Pacific Ocean to the starting line for the 2019 Chilean SANTANDER J/70 Nationals. Hosting the regatta was the Cofradia Nautica del Algarrobo. 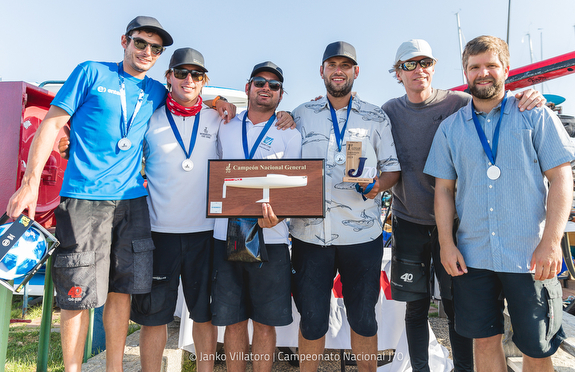 As the fastest growing class in Chile since the J/24, and with the best sailors in South America, the J/70 continues to attract the best talent for both skippers and crew. What no one anticipated was the regatta's outcome was going to be determined by a tie-breaker based on the results of the final race. In the end, it was an incredibly hard-fought regatta for the two protagonists in this year’s J/70 Nationals. Both sailors have tremendous pedigree as both have won many championships in J/24s, Lightings, Soto 40s, and Snipes, to name a few. Winning the tie-breaker was Mathias Robertson’s MORENITA with a 3-1-4-1 record for 9 pts. Losing the countback to settle for the silver on the podium was Pablo Amunátegui’s SANTANDER with a 2-2-2-3 scoreline. Meanwhile, the Corinthians Division celebrated their winners José Antonio Jiménez’s team on DARK SIDE. Here is what took place each melodramatic day on the water. The first day of racing started off with winds of 10 to 12kts from the northwest with very choppy seas from a large frontal system offshore. The PRO managed to run two races before the offshore wind finally shut down, a frequent occurrence after a slow moving frontal system passes over the Andes. Typically, the land heats up in such circumstances and creates an onshore, sea breeze from the west/southwest. But, that was not the case this time around. The Robertson brothers, Ro Robles and Pino Cubillos, took the lead at the end of the first day with a 3-1 score for 4 pts. The Robertson’s are from amazing Chilean sailboat racing pedigree; they are sons of Felipe Cubillos, their father raced in the Portimao Race (35,000nm around the world in Class 40) together with José Muñoz. Tied on points with the Robertson’s was Pablo Amunátegui’s SANTANDER with a 2-2 scoreline for 4 pts as well. On Saturday, light wind conditions offshore persisted, prompting an onshore postponement until 1500 hrs! Desperate to get in at least once race, the PRO sent the fleet offshore at 1530 hrs to get in just one race for the day. Incredibly, it was SANTANDER that maintained their steady pace, with skipper Amunátegui posting yet another 2nd place to take over the lead of the regatta. Sitting just two points back was Robertson’s MORENITA with a 3-1-4 tally for 8 pts. The final day dawned with more light winds. The forecasts looked a bit dismal, unfortunately. Again, the PRO had to do an onshore postponement at 0900 hrs that lasted, coincidentally, until 1500 hrs. At that point, the decision was made to make an attempt to get in one more race in about 6 kts of breeze from the normal seabreeze direction of West/ Southwest. The stakes were high, as whatever the outcome of the race, it was going to determine the championship. MORENITA had a fantastic start on the RC side of the line with great speed. From there, they took the lead at the first weather mark and simply sailed away to win the race. Meanwhile, their principal competitor, SANTANDER rounded in 5th place. At that point, it seemed like the regatta was over for SANTANDER. But, the drama was only going to build dramatically as the fleet continued to go around the buoys. On the first run, the wind went a little to the right and SANTANDER and Francisco Perez’s ELEANOR RIGBY were the first boats to gybe. Andres Ducasse’s TSUNAMI and Juan Reid’s WINDMADE/ DREAM YACHT CHARTERS stayed close to shore, looking for more pressure. Then, the left shift came in and both SANTANDER and ELEANOR RIGBY had a good recovery, but it was not enough. WINDMADE/ DREAM YACHT CHARTERS managed to gybe and run into the leeward gate in front of SANTANDER; 4th at that moment in the race, but still 2nd in overall in the standings. On the second windward leg, with good speed, SANTANDER took the left (closer to shore) and both TSUNAMI and WINDMADE/ DYC took off to the right on port tack, despite the left-swinging wind direction. SANTANDER made it work along the shore and rounded the second windward mark in 2nd place. 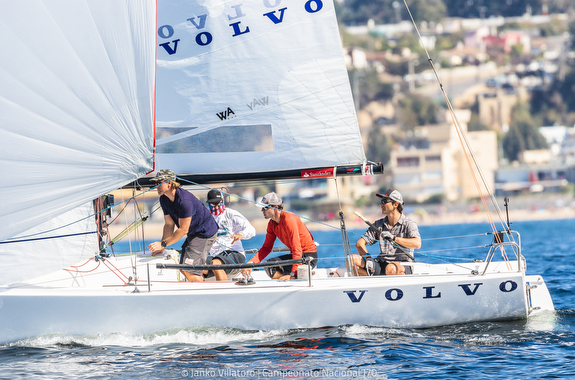 Next, was TSUNAMI in 3rd, WINDMADE/ DYC in fourth, ELEANOR RIGBY 5th, and Matias Seguel’s VOLVO in 6th. IF nothing changed on the downwind run to the finish, SANTANDER’s big gain meant they would be winning the regatta! However, positions could, and did, change! Again, the wind shifted into the right in the final 100 meters upwind at the weather mark, so WINDMADE/ DYC and TSUNAMI gybed onto port downwind, onto the favored gybe. Meanwhile, SANTANDER was still in second place, choosing the right side of the course downwind, closer to shore. Notably, the wind was decreasing in pressure and making everything more difficult tactically across the entire course. In the final approach to the finish line, SANTANDER made two gybes, in front of TSUNAMI and WINDMADE/ DYC. But, they did not block WINDMADE/ DYC, who was free to sail a faster angle to the RC finish boat. Incredibly, WINDMADE/ DYC finished in 2nd by one foot (!) ahead of SANTANDER! Thus, putting SANTANDER in between them and TSUNAMI at the finish! Those two gybes by SANTANDER may go down as the “text book” wrong move, hopefully never to be repeated again by the moribund crew! 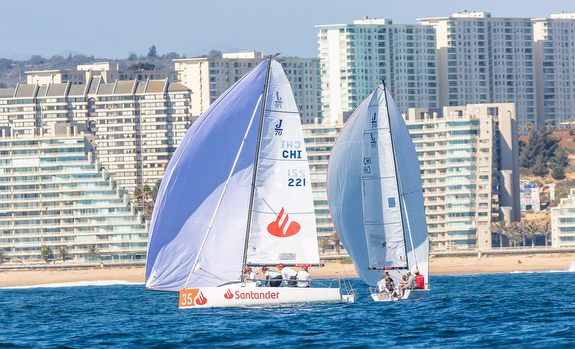 As a result, MORENITA won, with SANTANDER losing the tie-breaker to take second, with VOLVO third. Rounding out the top five overall was also determined on yet another tie-breaker on 21 pts each! Winning that “mano-a-mano” combat was Reid’s WINDMADE/ DREAM YACHT CHARTERS, taking fourth over Ducasse’s TSUNAMI in fifth place. Wow, that last race completely jumbled the ENTIRE top five standings in just 100 meters of the finish line!! Panic and anxiety in Algarrobo!! Meanwhile, in the Corinthians division, José Antonio Jiménez's DARK SIDE finished 6th overall with only Jimenez family members on board. Taking second was Patricio Natho’s TRILOGIA and in third was Cristóbal Pérez’s IL MOSTRO. The Race Committee was managed by Fernando Pérez Spencer and assisted by Claudio Gonzalez and Javier Alias Corniza. The Protest Committee was chaired by Claudio Salvatore. Begoña Gumucio was the PRO for the regatta and also coordinated all the activities ashore. The ex-Olympic sailor was crucial for the success of the championship on the water, social events, and the award ceremony. 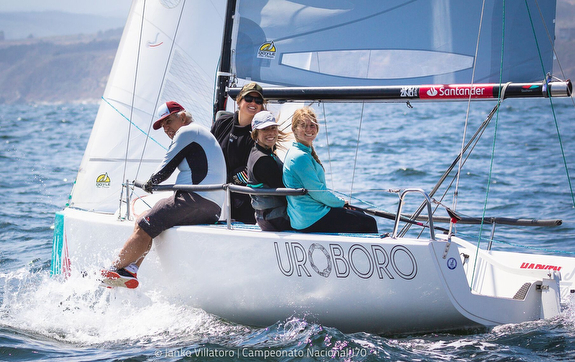 On Saturday morning, the 2020 J/70 Nationals host club and town was decided and the two finalists were Algarrobo and Lake Rapel. The Chilean J/70 Class directors are looking forward to sail outside Algarrobo and hope to resolve the logistics scenario to go sailing on Lake Rapel in the foothills of the Andes Mountains; the lake is about 2 hours south of the capital city of Santiago ~ 100 miles. Add to Flipboard Magazine.